The information and opinions offered on the Norman-Spencer website are intended for informational purposes only and are not intended to replace or substitute for any insurance, regulatory/safety, legal, or other professional advice. Every effort is made to provide accurate and complete information. However, Norman-Spencer cannot guarantee that it will be error free. Norman-Spencer makes no claims, promises or guarantees about the accuracy, completeness, or adequacy of the contents of this site and expressly disclaims liability for errors and omissions in the contents of both. Neither Norman-Spencer, nor its employees, officers, directors, owners, agents, representatives, and contractors make any warranty, expressed or implied or statutory, including but not limited to the warranties of noninfringement of third party rights, title, and the warranties of merchantability and fitness for a particular purpose with respect to content available on this site. Neither does Norman-Spencer assume any legal liability for any direct, indirect or any other loss or damage of any kind for the accuracy, completeness, or usefulness of any information, product, or process disclosed herein, and do not represent that use of such information, product, or process would not infringe on privately owned rights. If any portion of this disclaimer is determined by any court or other competent authority to be unlawful and/or unenforceable, the remaining portions of this disclaimer shall survive and continue in effect. By disclosing to Norman-Spencer, you consent to and authorize Norman-Spencer to use the voluntarily-provided personal information you provided to contact you via phone, fax, e-mail, or regular mail to provide you with information that Norman-Spencer believes may be of interest to you. If you wish to opt-out of receiving such information please follow the instructions found below in the Opt-Out section. If you are dissatisfied with the web site or with any terms, conditions, rules, policies, guidelines or practices of Norman-Spencer in operating this website, your sole remedy is to discontinue using this website. At various places on the Norman-Spencer Website, reference may be made to the rating assigned by the A.M. Best Company (“A.M. Best”) to the carriers we represent. According to its website, A.M. Best is a full-service credit rating organization dedicated to serving the insurance industry. The objective of A.M. Best “Financial Strength Rating” system is to provide an opinion as to an insurer’s financial strength and ability to meet its ongoing obligations to policyholders. A.M. Best’s “Financial Strength Rating” opinions are divided into two broad categories: Secure and Vulnerable. Secure rated companies have experienced a very low failure frequency, and include ratings from A++ and A+ (Superior), to A and A- (Excellent) to B++ and B+ (Very Good). In A.M. Best’s opinion, the highest rated Secure companies have a very strong ability to meet their ongoing obligations to policyholders, while the lowest rated Secure companies have a good ability. The higher a company’s Secure rating, the greater its ability to withstand adverse changes in underwriting and economic conditions over longer periods of time. Norman-Spencer and/or its affiliates may provide retail, wholesale and reinsurance brokerage, risk management, underwriting, captive management and benefits consulting and may receive remuneration as commission or fees paid by an insurer; fees paid by a client in lieu of, or in addition to, commissions; and investment income on premiums; claim payments and return premiums temporarily held as fiduciary funds. In certain circumstances, one or more of these affiliates may also receive compensation in the following forms: commission or fees paid to reinsurance brokerage or captive management companies for placement or management of reinsurance of a client’s risk; commission or fees paid to a wholesale broker to which a risk has been referred for placement; commission or fees paid for premium financing; and compensation paid by underwriters for performance of technical or other services. The material provided on the Norman-Spencer Website does not amend, or otherwise affect, the provisions or coverages of any insurance policy. It is not a representation that coverage does or does not exist for any particular claim or loss under any such policy or bond. Coverage depends on the facts and circumstances involved in the claim or loss, all applicable policy provisions, and any applicable law. Availability of coverage referenced can depend on underwriting qualifications and state regulations. Discounts, promotions, coverages, and benefits referenced on the Norman-Spencer Website may not be available in all States, are subject to specific insurance product underwriting guidelines and policy terms and conditions, and maybe discontinued, changed, or amended at any time. IMPORTANT: please note that NO coverage is changed or bound until approved by the carrier and written confirmation is sent to you. Coverage cannot be assumed if you do not receive confirming documentation. Norman-Spencer is dedicated to maintaining and protecting the privacy of our clients and visitors to the Norman-Spencer Website. All information you provide on this website is kept secure and policies are in place for handling sensitive information. Norman-Spencer will safeguard, according to industry prudent security standards, your confidential information. A fundamental element of safeguarding your confidential information is to provide protection against unauthorized access or use of this information. Norman-Spencer maintains physical, electronic and procedural safeguards that comply with applicable guidelines to guard your confidential information against unauthorized access or use. Norman-Spencer employees are limited in the access they have to information about you to what is reasonably necessary to complete their responsibilities, to maintain your accounts, to complete a transaction that you authorized, to notify you of new products and services, or otherwise meet your needs. They are subject to a corporate code of ethics and other policies that require maintaining the confidentiality of customer information. If you voluntarily-provided personal information to Norman-Spencer, Norman-Spencer may share your personal information only with companies we have selected to provide insurance related services or that support Norman-Spencer operations. We do not sell or rent personal information to telemarketers, mailing list brokers, or any other companies that are not offering/providing Norman-Spencer endorsed services or benefits. The views and opinions offered in newsletters and articles appearing on the Norman-Spencer Website are practical in nature and intended for informational and enjoyment purposes only and are not intended to replace or substitute for any insurance, regulatory/safety, legal, or other professional advice. Norman-Spencer recommends that you follow the safety rules, regulations and procedures of license professionals and your local/state/federal authorities and regulators. Norman-Spencer does not guarantee that information contained in any newsletters and/or articles will be error free, and hereby puts the reader on notice that there may be inadvertent technical or factual inaccuracies and typographical errors. Norman-Spencer makes no claims, promises or guarantees about the accuracy, completeness, or adequacy of the contents of the newsletters and articles appearing on the Norman-Spencer Website and expressly disclaims liability for errors and omissions in the contents therein. Neither Norman-Spencer, nor its employees, officers, directors, owners, agents, representatives, and contractors make any warranty, expressed or implied or statutory, including but not limited to the warranties of noninfringement of third party rights, title, and the warranties of merchantability and fitness for a particular purpose with respect to content available from the newsletters and articles. Neither does Norman-Spencer assume any legal liability for any direct, indirect or any other loss or damage of any kind for the accuracy, completeness, or usefulness of any information, product, or process disclosed herein, and do not represent that use of such information, product, or process would not infringe on privately owned rights. If any portion of this disclaimer is determined by any court or other competent authority to be unlawful and/or unenforceable, the remaining portions of this disclaimer shall survive and continue in effect. In accordance with applicable guidelines, including the FTC, concerning the use of endorsements and testimonials in advertising, please be aware of the following: Testimonials appearing on the Norman-Spencer website are received in various forms via a variety of submission methods. The testimonials reflect the real life experiences of customers and business partners who have worked with us, used our products and/or services. However, results may vary. We do not claim, nor should the reader assume, that any experience recounted is typical or representative of what any other customer might experience. Testimonials are not necessarily representative of what anyone else using our products and/or services may experience. The people giving testimonials may have been compensated for use of their experiences. The testimonials displayed are given verbatim except for grammatical or typing error corrections. Some testimonials may have been edited for clarity, or shortened in cases where the original testimonial included extraneous information of no relevance to the general public. Norman-Spencer is not responsible for the opinions or comments posted on the Norman-Spencer Website, and does not necessarily share the opinions, views or commentary of postings on this website. All opinions expressed are strictly the views of the poster or reviewer. All testimonials are reviewed for authenticity before they are posted for public viewing. Testimonials on the Norman-Spencer Website are not intended, nor should they be construed, as fully comprehensive, nor do they consider specific objectives, circumstances or needs of individual recipients. This is not intended to replace or substitute for any professional advice. All businesses featured on the Norman-Spencer Website are responsible for notifying Norman-Spencer in writing or email, of any changes to their address, offerings, name, contact info, or other relevant details. To be removed their content, a business is responsible for contacting Norman-Spencer in writing or email. Advertisements are provided solely as a convenience to you and not as an endorsement by Norman-Spencer of the contents on such third-party. Norman-Spencer does not make any representations regarding the content or accuracy of advertisement materials or content. Advertising opportunities may be made available to businesses upon request and at the discretion of Norman-Spencer. Cost, placement, duration and all other details are negotiated by the director of Norman-Spencer in accordance with the goals and mission of Norman-Spencer. There are no guarantees that there will be advertising opportunities available at any given point in time. Advertiser is solely responsible for any liability arising out of or relating to its advertisement and content. Advertiser represents and warrants that it holds the necessary rights to permit the use of the advertisement, and that the use, publication, reproduction, distribution, or transmission of the advertisement will not violate any laws or rights of any third parties, including, but not limited to, such violations as infringement or misappropriation of any copyright, patent, trademark, trade secret, or other proprietary or property right, false advertising, unfair competition, defamation, invasion of privacy or rights of celebrity, violation of any anti-discrimination law or regulation, or any other right of any persons or entity. 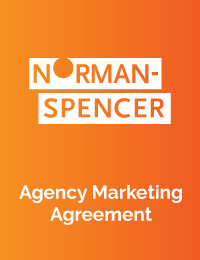 Advertiser agree to indemnify Norman-Spencer and to hold Norman-Spencer harmless from any and all liability, loss damages, claims, or causes of action, including reasonable legal fees and expenses that may be incurred by Norman-Spencer, arising out of or related to Advertiser’s breach of any of the foregoing representations and warranties. Norman-Spencer reserves the right to make changes to these Terms and Conditions at any time. If any of these conditions shall be deemed invalid, void, or for any reason unenforceable, that condition shall be deemed severable and shall not affect the validity and enforceability of any remaining condition. The information included in the Norman-Spencer Website could include technical or other inaccuracies or typographical errors. Amendments are periodically made to the information contained in the Norman-Spencer Website. Norman-Spencer may make improvements and/or amendments to the Norman-Spencer Website at any time. Any and all portions of this disclaimer and this agreement shall automatically apply to all improvements and/or amendments as they appear on the Norman-Spencer Website. All content within the Norman-Spencer Website is the property of Norman-Spencer unless otherwise stated. All rights reserved. No part of the newsletters may be reproduced, transmitted or copied in any form or by any means without the prior written consent of Norman-Spencer. I agree to the electronic delivery of my document(s) for insurance and other records pertaining to my insurance policy or polices. I agree to receive periodic electronic communications from Norman-Spencer, and its affiliated companies, concerning my insurance policy or polices and related products and information Norman-Spencer believes I may have an interested in. I understand that I may print and retain paper copies of all electronically transmitted submissions concerning my document(s). In addition, I may request a paper copy, free of charge, of document(s) that were delivered electronically by contacting service@norman-spencer.com with your name, policy number, and the words “Mail My Policy” in your email. I understand that in the event my personal contact information changes or any error is detected, I must immediately notify Norman-Spencer by contacting service@norman-spencer.com with your name, policy number, and updated personal contract information. I understand that I may withdraw my consent provided hereunder at any time upon notice to Norman-Spencer by contacting service@norman-spencer.com with your name, policy number, and the words “Opt Out” in your email. I understand that in order to access and transmit my document(s) electronically I must have a personal email address and access to a personal computer with Internet access and a compatible internet browser. As indicted on the consent form you accepted, and above, you can request a free copy of your insurance policy or policies at any time by following the instructions above, or you can withdraw your consent to receive electronic policy delivery at any time by following the instructions above.